The Seven Songs by T. A. Barron. A Merlin Book. Review: Merlin has finally returned hope in Fincayra. But danger still lies waiting to strike, and the first to be hit is none other than Merlin's mother. Who is next? Can Merlin save his mother and Fincayra from certain doom? Will Merlin die on his quest? T.A. 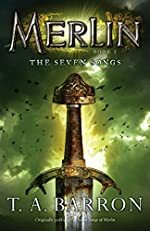 Barron will answer all in the 2nd book The Seven Songs from the Merlin Saga. In the past, Merlin or Emirs the name he knew, had adventured to the land of Fincayra to find his past. He learned about it threw many trials, and changed from an ignorant boy to a sharp man. Since then the land changed from a dark, gloomy, and controlled place to a joyful one where everyone is able to talk, sing, and write freely. Merlin, now knowing his past, wants to bring Fincayra to its former glory. This spellbinding book begins with Merlin thinking about his past, first Tuatha, his deceased grandfather and great wizard. He remembers him saving Rhia, his tree-like friend, from his father's hand Stagmar who is being controlled by the dark mastermind Rhita Gawr. Then he remembers when he was given the Flowering Harp to restore the lands that Rhita Gawr once controlled. But then he is interrupted with the thought of his mother, and his longing for her to join him. This drives Merlin to forget his duties and return her to Fincayra. As it turns out, this decision is a grave mistake because she has been cursed and is destined to die. So Merlin sets out on a quest to gain the secrets of the seven songs to go to Dagada for help. Will Merlin succeed, or fall to the life-changing challenges ahead? Will Merlin's mother die? The Seven Songs is an excellent book for elementary and middle-school students as it is not challenging to read and has a relatively easy vocabulary and plot structure. This book in fact will make readers sit on the edge of their seat waiting to see what happens next. Fantasy and magic lovers will enjoy this book like none other, due to its enchanting adventures throughout the land or into a mysterious realm of spirits. You readers think you can predict Merlin, well think again. The Seven Songs is full of surprises that can never be imagined. Also there is a very unique exposition where the setting of the story is the magical floating island Fincayra with dark hills, reflecting lakes, and unseen creatures. In addition the plot includes many twists and turns that make a coaxing atmosphere. Realistic fiction readers will enjoy this book too. It includes many challenges that are faced in real life such as dealing with your adamant sister, or sticking up for yourself. Plus The Seven Songs is in a series, so you can read many more of Merlin's adventures, and the excitement doesn't end. Just get The Seven Songs and other books in the series by T.A. Barron to start your reading adventure. We would like to thank T. A. Barron for providing a copy of The Seven Songs for this review. Have you read The Seven Songs? How would you rate it?